Life in the clergy is quiet, respectful, peaceful or so Callie Anson believes when she begins her new job as curate to the Reverend Brian Stanford at All Saints Church in Paddington. Little does she realise how wrong she could be. After the traumatic end of her relationship with fiancé Adam, the last thing Callie needs is any more emotional turmoil. But it seems she is not destined for a quiet life just yet. Knowing that women in the clergy are still disapproved of in certain quarters, Callie is prepared to face some criticism. But the deep-seated hatred shown by some of her respected male colleagues takes her by surprise, particularly the spiteful attack made by Father Jonah Adimola, a hard-line conservative Nigerian priest. Luckily, however, her good friend and mentor Frances Cherry is on hand to jump to her defence. But when Father Adimola is found strangled to death the next day and Frances is suspected of the crime, Callie must call upon her faith to steer her through the troubling and violent times ahead and help prove her friend's innocence. With DI Neville Stewart heading the investigation, it is not long before the ecclesiastical façade is chipped away to reveal the ugly truth of the hidden secrets of the clergy. Evil Intent is a gripping crime novel that pitches the reader into a dark world of concealment, power and deception, as up-to-date as today's headlines. "An expatriate living in England, Charles delivers a compelling story woven around the twenty-first-century Anglican Church. Callie Anson, the first woman curate in Paddington, is trying to deal with the displeasure her hiring has unleashed, both among congregants and other priests. Callie welcomes the friendship of Frances Cherry, a progressive woman who argued for ordination of women long before it became a cause. Accompanying Callie to her first clergy chapter meeting, Frances clashes with ardently conservative Nigerian priest Father Jonah Adimola, who speaks out against female priests. Jonah is later found murdered, and suspicion falls squarely on Frances. As Callie tries to prove her friend's innocence and win over the naysayers in her congregation, a subplot develops concerning a secretly gay priest who has been appointed bishop. 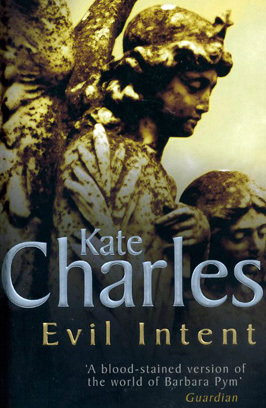 Charles paints a vivid picture of the complex issues facing the Church of England today and, in an author's note, states her own view that how the church deals with homosexuality will be its defining issue for the foreseeable future." - Jenny McLarin, Booklist, Copyright © American Library Association. All rights reserved. This text refers to the Hardcover edition.